NHL Central Scouting says: Very good positional style goalie; focused with good concentration – always finds the proper position to give himself the best chance to stop the puck – powerful and quick leg drive to move across laterally or to move out to challenge – very efficient in post to post play – good athleticism and flexibility – strong at holding his position and protecting against the wraparound – quick to recover back to his feet after saves – good job of sealing the short side on sharp angle attempts and snapping his pads to the ice to seal the five hole – good use of his gloves – decent overall rebound control. NHL Central Scouting says: Excellent pro size giving him a huge net presence – very good positionally; solid stance and displays good quickness and timing when dropping in the butterfly – excellent leg extension when in butterfly – plays the top of the paint and is square to the shots; does not leave much room for shooters – moves extremely well for his size; good balance and very efficient and controlled with lateral movements – good overall quickness; makes post to post play look very easy – strong on wraparound attempts – likes to handle the puck more than most goalies – very good balance in stance – very good overall rebound control. NHL Central Scouting says: Big bodied puck-moving defenseman – plays shut down role against top opposition lines and penalty kill – keeps pucks moving at offensive blueline and has a big shot – makes simple, safe plays under pressure – effective defender that combines good positioning and physical play with a good stick – solid two-way defender. 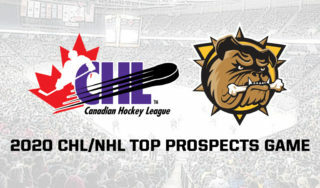 NHL Central Scouting says: High end two-way defenseman that excels in all situations – top 10 in the WHL for points for defensemen and first in goals – plays in all situations and logs big minutes every game – played for Team Canada at the Hlinka Gretzky tournament and for Team West in the CIBC Canada/Russia Series – considered the top North American defenseman for the 2019 NHL Draft. NHL Central Scouting says: Very good skater with excellent quickness and mobility to his game – an offensive-minded defenseman with the requisite puck skills – good speed with and without the puck – ultra quick out of the blocks and in transition – likes to start or join the offensive rush – good, hard shot from the point – very good at handling the puck and making plays at the offensive blue line – excellent compete and battle for the puck. NHL Central Scouting says: Very smart puck-moving defenseman – great vision and instincts with and without the puck – very poised and patient on plays; makes excellent heads up decisions in all zones and in transition as well – effectively sorts out options very well – strong and smart at protecting the puck – a very efficient, fluid skater with excellent quickness and mobility – easily defends the one-on-one rush – very good execution on breakouts – important player on his team playing big minutes in all key situations. NHL Central Scouting says: Smooth and effortless skater – hard to knock off the puck – positions himself well when defending; solid containment game – displays patience with the puck – good vision and decision making – not a physical player but finishes his checks with authority – can and does play an offensive game and finds ways to contribute when needed; effective role on the power play – effective game to lead the rush with good outlet passes – played for Team Canada at the Hlinka Gretzky tournament. NHL Central Scouting says: Plays a consistent, effective two-way game – strong skater with good mobility – a big presence to effectively play the size/strength game; plays the body and finishes hits with authority – looks to get involved with the offense as he supports the rush up ice – handles and moves the puck effectively on plays; gets his shots through to the net from the point – utilized in all situations – does well defending one-on-one rushes and has an effective stick-to-puck game – played for Team Canada at the Hlinka Gretzky tournament. NHL Central Scouting says: Very good puck skills and ability to get open – good skater that uses his quickness to beat defenders – very good shot and ability to finish when given the opportunity – feet in motion makes him hard to defend and he can turn pucks over with his quickness on the forecheck – played for Team Slovakia at the Hlinka Gretzky tournament. NHL Central Scouting says: Displays explosive speed with excellent acceleration – makes quick decisions on the fly – can be a game changer – competes at an elite level – tough to contain in all areas of the ice – quick read and react game – a threat in all situations; creates scoring chances on almost every shift – drives to the net with authority – plays well on the defensive side of the puck – played for Team Canada at the Hlinka Gretzky tournament. NHL Central Scouting says: Big size/strength forward with a very good skill set – strong power game down low protecting puck and driving puck to the net – excellent shot with a very good release – good understanding of the game with and without the puck to play well in all situations – played for Team Canada at the Hlinka Gretzky Cup. NHL Central Scouting says: Excellent scorer with elite offensive hockey sense – very smart at getting in position for a quality scoring chance – already possesses multiple quality NHL shooting skills; very quick release to bury chances and a very strong one time shot – underrated playmaker; has very good hands and good puck control game – effective game with and without the puck – utilizes size/strength while shielding the puck from defender – knows how to position himself to receive a pass for a quick shot – dangerous offensive player who is always a threat on the power play – played for Team USA at the Hlinka Gretzky Cup. 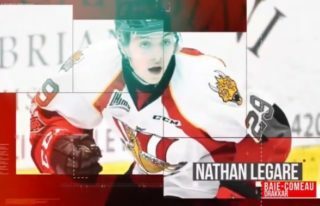 NHL Central Scouting says: Deceptively smart and skilled centre – utilizes his speed and quickness to advantage – not afraid to go into the hard areas; tough to contain in one-on-one situations – plays all situations and a very responsible 200-foot game – very good hockey sense to own the puck and dictate the plays – plays top minutes each game – an elite two-way player who can be an offensive threat or shutdown player; comes to play the same way either at home or on the road – played for Team Canada at the Hlinka Gretzky Cup. NHL Central Scouting says: Good size/strength forward – hockey sense is one of his strongest assets – wants the puck on his stick and can finish in tight and under pressure – plays a very responsible two-way game – versatile and effective playing either on the wing or in the middle – brings a physical element when needed and is strong below the dots with the puck – smart puck decisions and is hard to knock off the puck. NHL Central Scouting says: Strong physical winger that creates space for himself and teammates – natural knack to get open for the puck in good spots to score – good instincts and ability to force turnovers with his strong forecheck game – effective board play and very effective off the cycle – smart puck decisions and 200-foot game – legitimate point producer. NHL Central Scouting says: Skilled winger with very good offensive instincts – deceptively quick and elusive; able to makes quick decisions and good plays in tight spaces – very good hands and vision to make the high end plays; has the ability to find open space – drives the net quickly and quick release shot to finish his chances – protects the puck well and changes speeds to effectively keep defenders off – played for Team Switzerland at the 2019 World Junior Championship. NHL Central Scouting says: Power winger who is a solid skater that plays a high compete game – keeps feet moving and drives the net – strong game down low along the boards to win puck battles – ability to find open space and finish chances around the net – deceiving playmaking skills make him a very good offensive threat – smart player that makes good decisions – played for Team Canada at the Hlinka Gretzky Cup. NHL Central Scouting says: Missed games due to injury earlier in the season but playing like he hasn’t missed a beat, scoring at a point per game; offensive catalyst for his team – highly skilled winger with natural offensive instincts – strong puck protection game (for his size) allows him to extend puck possessions – puck-on-a-string hands; dangerous scoring threat when given time and space – excellent playmaker who can make plays at top speed – played for Team Canada at the Hlinka Gretzky Cup. NHL Central Scouting says: Brother of Dallas (NHL) signee Jason Robertson – missed time earlier in the season due to injury – not big but applies his craft with smarts and skills that force opposing teams to give him proper respect and attention – excellent skater, has water bug elusiveness and heads up abilities with eyes in the back of his head – relentless energy with a feet moving game; makes it difficult to stop without taking a penalty on him – offensively dynamic, with a quick release and hard one-timer – played for Team USA at the Hlinka Gretzky Cup. NHL Central Scouting says: Smart playmaking centre who displays good vision and awareness of linemates – good hands and vision in traffic to make plays – at the top of his game when playing a heads up/feet moving style – strong on the forecheck and goes hard after loose pucks – plays both powerplay and penalty-killing units – willing to battle for position and the puck in all areas of the ice; doesn’t shy away from going to the hard areas – anticipates well on both sides of the puck and plays a responsible two-way game – played for Team Russia at the Hlinka Gretzky Cup.